Subtle flavors complement just about any main course at a buffet, picnic, barbecue or formal meal. long grain white rice, unprepared	 22 oz. 1 qt. 1. 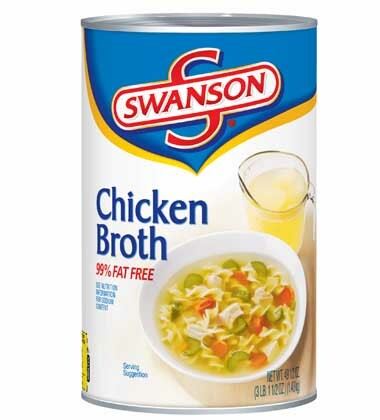 Heat the Swanson® Chicken broth to a boil over medium-high heat. Stir in the rice and lentils. Reduce the heat to low. Cover and cook for 20 minutes or until done. Let stand for 5 minutes or until the liquid is absorbed. ground red pepper	 2 oz. 1 tbsp. celery, sliced	 11 oz. 1 qt. red onion, medium, chopped	 2 lb. 8 ea. red bell pepper, diced	 21 oz. 1 qt. fat free vinaigrette dressing	 1 qt. 2. Toss the lentil mixture, parsley, ground red pepper, celery, onion, green pepper and vinaigrette in large bowl until evenly coated. Cover and refrigerate for at least 2 hours or overnight. Hold for cold service at 41°F until needed. 3. 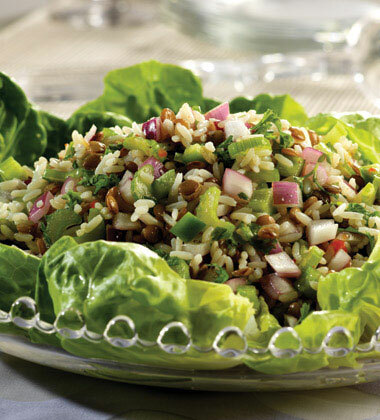 To Serve: Using a #8 scoop, portion 1/2 cup lentil mixture into each lettuce cup. Serve immediately. long grain white rice	 22 oz. 1 qt. celery	 11 oz. 1 qt. red onion	 2 lb. 8 ea. red bell pepper	 21 oz. 1 qt. Pair with Tangy Grilled Beef and 1/2 cup of fresh blueberries for a meal under 500 calories.